Stop Unhealthy Habits Where They Start: At Home! 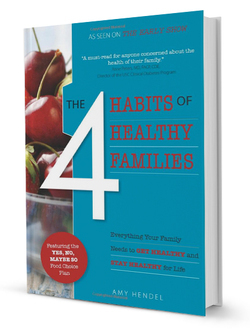 Most families today barely have time to say hello to each other, much less to cook, eat right or exercise. No wonder obesity rates and related health problems for adults and children have gone sky-high. But it's not too late to stop the cycle of unhealthy lifestyle habits. Amy Hendel has helped hundreds of busy families make lasting changes, lose weight and get healthy together. She can show you how to turn your family around-and help save you and your kids from a lifetime of compromised health and quality of life. 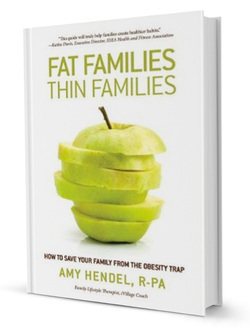 In The 4 Habits of Healthy Families: How to Save Your Family from the Obesity Trap, Amy Hendel offers an easy-to-read guide to transform the health of your family-for life. Amy shows readers how to make healthy new habits a part of everyday life, with sensible time-saving and budget-saving tips that can work for any family. Through her work with clients, as a health contributor on NBC's the Today Show and as a mentor and life coach on village.com, Amy has become a leading voice on the topic of lifestyle habits for families. She's designed an easy-to-follow, versatile program with plenty of options to make success possible for every family-even yours!